If you work with high-resolution raw files and advanced effects, you’ll need the best photo-editing laptop you can afford. In this guide, we’ll walk through the best laptops for photographers, at a range of budgets, to help you choose the right option for your requirements. Right now, we think the latest Dell XPS 15 is the best photo-editing laptop you can get, thanks to its compelling blend of great screen quality and performance, and accessible price. There's no doubt that the latest MacBook Pro is still a stunning option, but you'll pay big bucks to get a taste of its speed and quality. But don't rule out options like the Lenovo ThinkPad X1 Carbon, specced with Lenovo's excellent 4K Dolby Vision-certified screen. And if you like to game as well as edit photos, the Razer Blade 15 has you well covered. Of course, the right laptop for you depends on exactly how you intend to use it. Will this be your main machine, for example, or is this a secondary device for taking on the move? How important is power and speed versus portability and battery life? We’d recommend a 15-inch screen size as the best balance between portability and having a versatile Photoshop workspace, but consider a slightly smaller 14-inch laptop if you want to travel really light. Happily, continuing advances in processor technology mean you can now get 6-core chips in laptops that sacrifice very little speed compared to their desktop computer counterparts. And these days, many sport pixel-perfect displays with stunning colour, and wide contrast to keep highlight and shadow detail consistently visible. Here, we’ve selected some of the most powerful laptops for photo editing on sale today, to ensure you don’t waste time looking at loading bars when you could be out shooting. To see which laptop is fastest, we ran the popular Geekbench and Cinebench benchmark apps, and got down and dirty with high resolution images in Photoshop CC 2018. Screen quality was assessed by our own highly trained eyeballs, as well as a Datacolor Spyder 5 Elite colorimeter to objectively evaluate colour accuracy, screen brightness uniformity, and colour space coverage. The Dell XPS 15 range can be confusing: there are currently 10 different UK spec options to choose from, and pricing can frequently fluctuate. We reckon the configuration above represents the best value for photographers though, as you get Dell’s best 4K screen spec with 100% Adobe RGB coverage, paired with a 6-core processor, plus a healthy amount of RAM and storage. The speedy Intel Core i7-8750H processor in our test machine was slower than a Core i9 model, but unless you’re a very heavy user, the approximate 20 per cent speed hit shouldn’t ruin your day. Likewise, 32GB of RAM would also be nice, but 16GB will be sufficient for Photoshop unless you’re working with giant stitched panoramas. 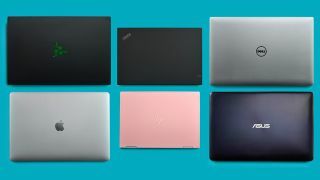 The selection of ports isn’t quite up there with the ZenBook Pro (number four in this list) – two USB, a single USB-C, HDMI and headphones – but there is a full-size SD slot; something that’s sadly becoming a rarity in premium laptops. With a measured Delta-E colour accuracy of 1.21, Dell’s 4K screen isn’t quite a match for Apple’s Retina display, but it can give much pricier Windows machines a run for their money. Full Adobe RGB coverage is a bonus, but it’s a pity screen brightness uniformity was noticeably more uneven than the competition, and visible to the naked eye in some scenarios. However, this issue may be specific to our test sample and doesn’t detract from this laptop’s incredible value. Overall, this is our pick for the best photo-editing laptop you can buy right now. Our MacBook Pro test machine came maxed out with a range-topping Intel Core i9 8950HK processor and 32GB of RAM, so it’s no surprise that it aced our benchmark tests and felt lightning fast in Photoshop. Along the top of the keyboard you’ll find Apple’s Touch Bar. This row of virtual buttons dynamically changes according to your current app, and Photoshop makes great use of it. The Touch Bar automatically displays adjustment buttons and sliders depending on your selected pallet or tool. The main Retina display has an aspect ratio closer to 3:2 than 16:9, making it better suited to displaying photos from most cameras. The 2880 x 1800 resolution may be less that 4K, but it’s easily crisp enough. It also sports Apple’s True Tone technology that automatically tweaks the screen’s colour to compensate for ambient lighting. We disabled the feature for consistency and recorded an outstanding Delta-E figure of just 0.54. Screen brightness uniformity also scores well, leaving just the 84% Adobe RGB coverage trailing some rival Windows laptops. This particular spec doesn’t come cheap, but the base 15-inch Pro still packs a very fast 6-core Intel i7 processor, and equipped with a 512GB SSD is around $900/£800 less. However, whichever config you choose, you only get Thunderbolt 3 ports, meaning if you want to connect conventional USB devices you’ll need annoying adapters. Still, if budget isn't a problem, this is one of the best laptops for photo editing you can buy. The sixth-gen Lenovo ThinkPad X1 Carbon can be specced with several screen options – all 14-inch – but we went for the range-topping Dolby Vision-certified panel, boasting 500-nit brightness and a huge 1500:1 contrast ratio. It isn’t a touchscreen, and the 2560 x 1440 resolution trails 4K, but you’ll need a magnifying glass to notice that, and fewer pixels to push means better battery life. We measured an excellent Delta-E colour accuracy of 1.2, 100% Adobe RGB coverage, and brightness even beyond the stated spec, though brightness uniformity was more average. The same can be said for the X1’s speed, which falls noticeably short of laptops packing 6-core processors, though the trade-off is increased power efficiency. Plus you still get enough performance for all but the most intensive Photoshop tasks. If you value portability and battery life over extreme speed, yet you don’t want to compromise on screen quality, this configuration of the X1 Carbon makes for a fantastic photo-editing laptop. The big talking point with the Zenbook Pro UX580 is its touch pad that doubles as a secondary screen. Asus calls it the ScreenPad, and you can use it as a calculator, media player interface, or simply as a virtual numpad extension of the main keyboard. However, at the time of writing Photoshop isn’t coded to take advantage of the ScreenPad. It’s a missed opportunity that could give it similar versatility to the MacBook’s Touch Bar. Thankfully there are no shortcomings with the main display. We verified its advertised 100% Adobe RGB colour space coverage, and the quoted Delta-E <2 colour accuracy is also accurate, as our calibration tool measured an impressive 1.07. Outright screen brightness isn’t quite on par with the MacBook’s Retina display, but you’re unlikely to notice during real-world viewing. The UX580 is equipped with the same 6-core Intel Core i9 processor as the range-topping MacBook Pro, and we achieved very similar benchmark scores. This particular processor has a reputation for running so hot that its speed slows to keep things cool. However after a brief period of ‘throttling’, our Zenbook’s fans spun up and it maintained full performance under continuous full load; important for video rendering. There’s a good balance of two USB-C, two conventional USB ports, an HDMI port and headphone socket, though the Micro SD card slot is of limited use to photographers. Razer’s brand focus is on the gaming market, and the Blade 15 4K is primarily a gaming laptop, but the styling doesn’t shout about it like many laptops targeted at gamers. Only the illuminated green Razer logo on the front and the colour-changing backlit keyboard give the game away, but the latter can be muted to keep things more sober. What makes the Blade 15 a good photo-editing machine is its 15.6-inch 4K screen, which boasts 100% Adobe RGB coverage and factory colour calibration. It’s a gorgeous display very similar to that used by high-end versions of the Dell XPS 15, and though its recorded 1.82 Delta-E score slightly trails the very high standard set by some rival screens, it’s still very colour accurate and a pleasure to view. The Blade also comes equipped with a faster graphics card than average in this sector. That’s great for gaming, where it’ll give a noticeable performance boost, but apps like Photoshop won’t really use the extra oomph. Fortunately the main Core i7 processor is plenty fast enough, scoring within 20 per cent of a top-tier Core i9 machine in our benchmarks, but using less power and generating less heat in the process. We also appreciate the solid build quality with excellent heat ventilation, as well as the three conventional USB ports (though the absence of an SD card slot is a shame). LG makes the Gram in three screen sizes: 13.3-inch, 14-inch, and 15.6-inch. We'd give the 13.3-inch version a miss, as you'll soon find that screen size restrictive for Photoshop, but the larger models are more tempting. Both sport a Full HD 1920x1080 resolution; less than many rivals here, but it's enough to produce a crisp viewing experience on our 14-inch Gram sample. The screen's IPS LCD tech produces great viewing angles and punchy colours. We measured 100% sRGB colour space coverage, and though a 79% Adobe RGB figure isn't great on paper, it won't be a deal-breaker for hobbyist photographers. Slightly more concerning is a Delta-E colour accuracy of 2.01, which is worse than many of the other laptops here, but generally a figure of 2 or less is considered quite accurate. The Gram is all about portability. The 14-inch version has an advertised weight of 995g, and we measured ours at just 960g. Compare this to the equally small Lenovo 14-inch ThinkPad X1 Carbon that weighs around 1120g and the Gram is noticeably lighter in the hand. The slim design still has room for a versatile selection of two USB-A ports, one USB-C port and an HDMI port, plus a microSD slot. While satisfyingly quick in general use, the 4-core Intel Core-i5 processor in our Gram struggled in our speed benchmarks and can take a while to apply more complex Photoshop filters. However the payoff from using a processor geared towards efficiency over outright speed is stellar battery life: LG claims up to 21.5 hours per charge. We'd still like more RAM though, as the installed 8GB is cutting it fine for Photoshop work. 16GB can at least be installed if you're handy with a screwdriver. Factor LG's keen pricing for the Gram and it's a tempting option if you value portability over speed. If you regularly take your laptop out on shoots, the compact 30.6 x 21.8 x 1.36cm, 1.29kg HP Spectre is a tempter. The x360 moniker refers to the touchscreen’s ability to flip round through 360 degrees so the laptop can convert to a tablet. Windows 10 automatically detects the screen’s position and adapts the interface to be more touch-friendly, but the Spectre isn’t particularly comfortable to hold in tablet mode. The 13.3inch screen may be good for portability, but it results in a restrictive Photoshop workspace that requires pallets to be minimised for an acceptable image area. The touchpad is also quite small, and we found it had an annoying glitchiness, but hopefully this was unique to our test sample. A 4K resolution across a screen of this size makes it extremely crisp, and while the display’s Delta-E colour accuracy score of 2.75 isn’t great, this does improve to 1.22 after calibration. Overall brightness, uniformity, and 81% Adobe RGB coverage are however average. The same can be said of performance, with the Intel i7-8550U processor geared towards power efficiency over outright speed. We’d also recommend upgrading to 16GB of RAM to ensure Photoshop smoothness. Just a single normal USB port is present, along with two USB-C ports and a Micro SD slot. We do at least like the automatic facial recognition for Windows sign-in. This certainly isn't the best photo-editing laptop here on a performance level, but for portability and versatility it does score highly. Laptop screens used to be more eye-sore than eye-candy, with appalling contrast and viewing angles. Thankfully IPS display tech fixes this and you shouldn’t settle for anything less. An SSD (solid state drive) is a must in any new laptop. All our options in this buying guide include one, but don’t get stuck with a small capacity: 512GB is a minimum if you’re working with 4K video. Dedicated graphics cards are great for gaming, but they’re not a necessity here. Today’s processors can fill in for them, and they pack enough pixel-pushing punch for photo editing. Laptop processor model numbers are practically impossible to decipher. Just focus on the ‘base frequency’ (speed, measured in GHz), and number of processing cores (two, four, or six). The MacBook is favoured by many photographers, and for good reason. But don’t rule out comparably priced laptop PCs, which can offer more bang per buck, with better upgradability.